Each week, I'll be preparing you for the Patriots upcoming opponent with a scouting report, going over the opponent's roster with a focus on how they will specifically match up with the Patriots. This week, the Patriots will finally begin division play with a short trip down 95 to visit their old friends in New Jersey. The red hot Jets actually come into this weeks showdown riding a three game winning streak, vastly exceeding fan and media expectations for a team most thought was blatantly tanking. 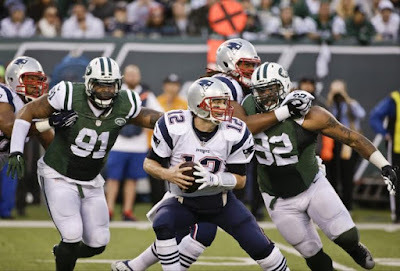 The Jets historically have always played the Pats close at home, regardless of the talent discrepancy between the two, and this Pats team has seen four of their five games come down to the fourth quarter. With that in mind, here's a closer look at how the matchups could play out on the field this Sunday. This Jets offense hasn’t been good by any means. They rank in the bottom 10 of the league in many significant categories, including points (18.4 per game, 23rd), total yards (26th), first downs (30th), turnovers (21st) and passing yards (25th). It’s a testament to how low expectations were for the tanking Jets that this actually could be considered overachieving, as veteran quarterback Josh McCown’s competency has done wonder to stabilize an offense low on playmaking talent. The relative strength of this unit has been the run game. 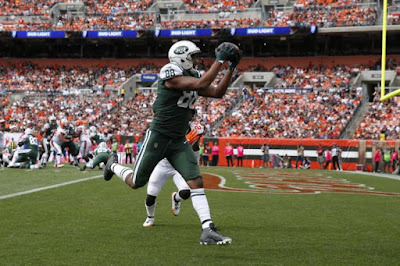 Through five games, they’ve rushed for 4.5 yards per carry, with veterans Bilal Powell (#29) and Matt Forte (#22) combining with rookie Elijah McGuire (#25) to contribute to a backfield committee. It’s looking like health will factor heavily into who gets the work for the Jets backfield this week. 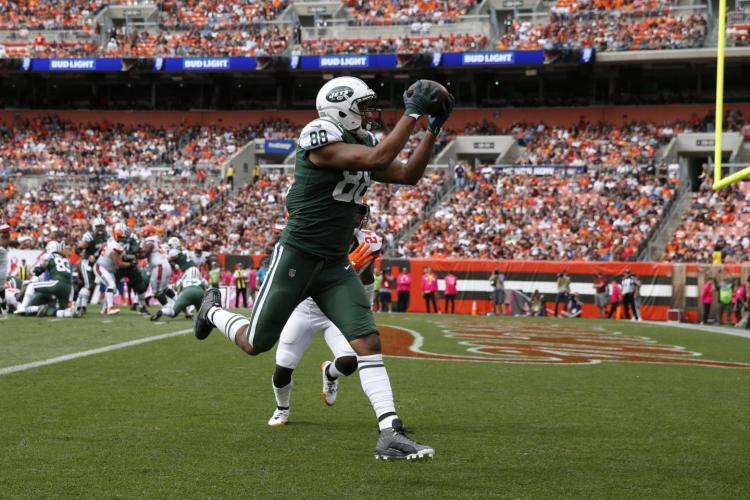 Bilal Powell has been the most productive member of the backfield, but his status for Sunday is iffy at best after leaving midway through last week’s win with a calf strain. He has yet to practice this week and will likely be noticeably limited even if he is able to suit up. That would be a big loss for the Jets, as Powell has been their best offensive playmaker this year. The versatile veteran has done it all for the Jets, averaging 4.7 yards per carry on the ground while also serving as a reliable dump off option in the passing game. Powell’s passing game chops would certainly come in handy for the Jets this week, as the Pats have had some noteworthy struggles covering the league’s better pass catching backs. If Powell is unable to go, lead back duties are likely to fall on the rookie McGuire. A sixth round pick from Louisville this spring, McGuire came into the league known more for his receiving ability, but the presence of proven pass catcher Powell in the backfield previously had relegated McGuire mostly to early down change of pace usage. McGuire was effective with his limited carries through weeks two and three before exploding for 93 rushing yards on only 10 carries Week 4 against the Jaguars, with two catches for another 38 yards. However, he flopped in his follow-up game last Sunday, mustering just 20 yards on 11 carries against a Browns defense committed to stopping the run. If Powell is sidelined as expected, the rookie could be in for a heavy workload. 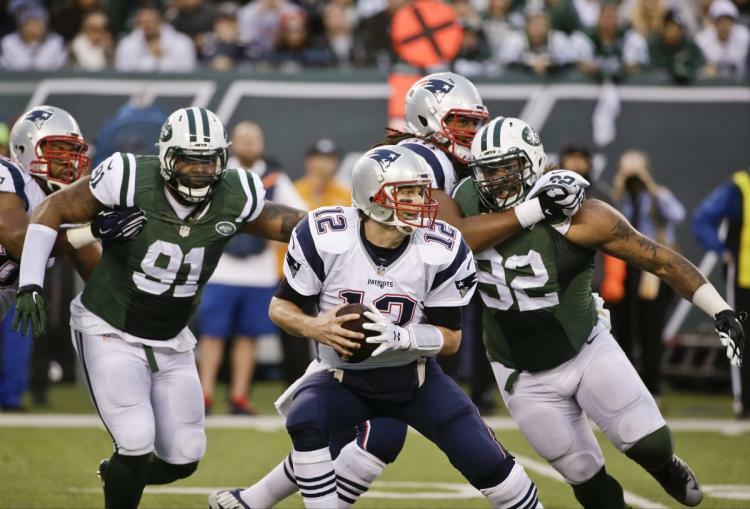 The Patriots showed vulnerability against the run last week against Doug Martin and the Bucs, and establishing a successful ground game would do wonders for a Jets offense that would love to keep Tom Brady on the sidelines as long as possible. McGuire is the team’s healthiest back and has enough size (5’10”, 214) to handle a full workload as the bellcow back if need be. He might not have to, as Matt Forte’s return to practice this week suggests the former Bears star may be back out there on Sunday. Forte has been missing since suffering a toe injury in Week 3. While Forte’s return to practice is a positive sign for Jets fans, expectations should be tempered, as his injury (turf toe) is notorious for lingering and effecting athletes throughout the season. Even when healthy, the 32 year old Forte hasn’t looked like the guy who starred with the Bears in years, although he looked a little more explosive through three weeks this year than he did last season. If he’s healthy enough to play, Forte will give the backfield another steady pair of hands, although the younger, healthier McGuire probably offers more upside as a between the tackles option. Travaris Cadet (#39) rounds out the backfield, with the former Saint serving as rarely used depth since being signed late in September. Cadet is almost exclusively a pass catcher who has been very productive as a Saint and done little of note anywhere else, including New York so far. Regardless of who gets the work, I’d expect the Jets to do their best to get the run game going Sunday. They simply haven’t had the ball enough to rank very high in attempts league-wise, but they’ve shown a old-school commitment to their ground game, running (124 attempts) almost as often as they’ve thrown (148 attempts). That kind of run-pass balance is fairly unusual in today’s NFL, but is necessary for a Jets team that is limited by it’s personnel in the passing game. 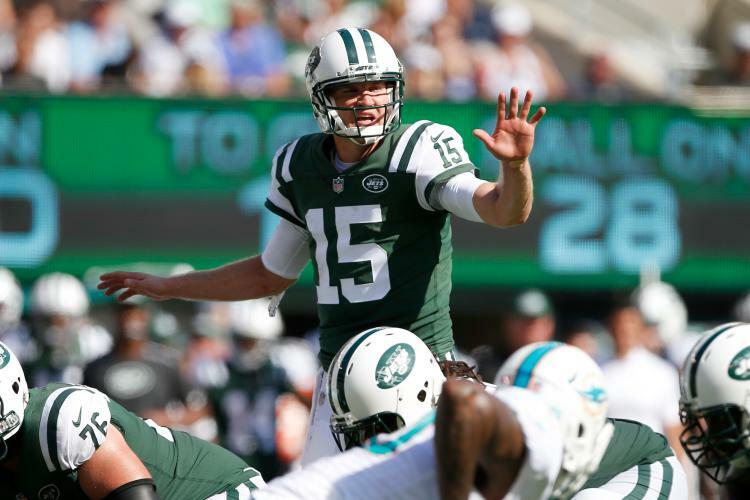 The fewer obvious passing situations they are put in, the better for these Jets. McCown’s leading receiver has been Jermaine Kearse (#10), who has seen a bit of a career revival since getting traded to New York. He trails teammate Robby Anderson (#11) by just one for the team lead in targets, while serving as a far more reliable option. More of a possession type receiver, Kearse has used his steady hands and big frame (6’1”, 209) to consistently out position defenders for the ball. He’s caught 78.6% of his targets and leads the team in receptions (22), yards (220, tied with Anderson) and touchdowns (3). Kearse is bookended by the speedy Anderson, who is your classic vertical speed receiver. Far more boom or bust than the steady Kearse, Anderson hasn’t been consistent this year, catching just 48.3% of his targets. However, big plays have happened when they’ve gotten him the ball. Anderson has turned his 14 catches into an impressive 220 yards (15.7 per catch), with a long play of 69 yards. The slot is manned by veteran Jeremy Kerley (#14), a crafty veteran who has made more than his fair share of plays against the Pats over the years. He’s remained his reliable self in 2017, catching all 17 of his targets over the past four games. Those have been of the dink and dunk variety, as Kerley has averaged just 7.8 yards per catch, working mostly with option routes out of the slot. Third round rookie Ardarius Stewart (#18) has been the distant fourth in this rotation. The Alabama product came with a reputation for generating yards after the catch, something the Jets tried to tap into with two designed runs last week. A week after having success playing the match-up man coverage their personnel is built to play, I would hope the Patriots will trust their corners to go out and play a similar scheme against a team with far inferior personnel. In this case, Stephon Gilmore would likely be tasked with eliminating the larger Kearse, with Butler following the deep threat Anderson and Jonathan Jones on Kerley. Butler will likely get some safety help over the top against Anderson, who is the only receiver of this group with true lid lifting ability. The Patriots defensive backs have the physical talent to smother this group and make it really tough on McCown. Doing so will just be a matter of execution, which has been inconsistent to say the least in the secondary this season. Playing matchup man will create an interesting matchup for Patrick Chung, who had by far his best game of the season last week against Tampa’s Cameron Brate. In this one, Chung would be matching up with Austin Seferian-Jenkins (#88), who has unquestionably been the team’s top tight end since returning from suspension. A high second round pick in 2014, ASJ has shown flashes of his immense physical talent, but hasn’t lived up to his potential so far in his still young career. Off the field issues ended his career with the Bucs prematurely, but he’s getting ample opportunities to turn his career around with playing time and targets on this Jets team. He seems to be becoming one of McCown’s preferred targets, with 6+ targets in two of his three games. When he’s on, he uses his big lanky frame almost like a basketball player to box out smaller coverage defenders and win contested balls. He’s a solid athlete for his size as well, with enough to speed to really threaten the seam on play action. The Jets rarely use multiple tight end sets, but when they do it will be Eric Tomlinson (#83) joining Seferian-Jenkins in the huddle. Another big (6'6", 263) body at the position, Tomlinson is receiving his first rotational playing time since entering the league as an UDFA in 2015. The offensive line hasn't exactly done a stellar job this season for Jets, as they've allowed McCown to get sacked 15 times through five games. The quiet bright spot has been the play of left tackle Kelvin Beachum (#68), who ranks in the top 20 amongst all offensive tackles in pass protection according to ProFootballFocus. A former Steelers standout, Beachum struggled last year in Jacksonville in his first year back from a torn ACL, but has looked closer to his excellent pre-injury form so far for the Jets. Unfortunately, no one else on this line can say they've played up to expectations. Right tackle is manned by Brandon Shell (#72), a fifth round pick from last year's draft. The nephew of Hall of Famer Art Shell, Brandon has played more than any one would have expected, as he was considered more of a developmental prospect than an NFL-ready prospect. However, he appeared in eight games with three starts as a rookie, and has held down the starting job on the right side so far this season. Unfortunately for Shell, his lack of top end athleticism has shown up on film, particularly in pass protection where he can struggle with quickness around the edge. He could have a tough time with Cassius Marsh, who is probably the Pats best speed rusher on the outside. The interior of the Jets line shouldn't be a weakness given their investments there, but the results just haven't met expectations. The starting guard duo of James Carpenter (#77) and Brian Winters (#67) each have contracts paying them amongst the top 15 players at their respective positions, but neither has played particularly well in 2017. A former first round pick of the Seahawks, Carpenter has been a mauling run blocker on the left side in the past, but he's simply failed to match the standard of play he's established in previous seasons with the Jets. Winters, a third round pick back in 2013, has particularly struggled to generate movement in the running game this year. Top utility backup Dakota Dozier (#70) has actually fared better than either of them when he's gotten on the field, but Dozier will likely remain on the sidelines this Sunday barring any unforeseen injuries. The worst position on this entire Jets offense has been center, where Wesley Johnson (#76) has struggled mightily to replace departed stalwart Nick Mangold. A 2014 fifth round pick of the Steelers, Johnson was claimed off of waivers by the Jets during his rookie year and has remained in the organization as a developmental prospect ever since. Mangold's injuries led to eight up-and-down starts for Johnson last year, with the ups being enough for the Jets to use a second round tender to retain him. Mangold's release this offseason left Johnson with the starting job by default, but he ranks 34th out of 34 center qualifiers in PFF's grading. If Alan Branch gets a chance to start making amends after being a healthy scratch last week, Johnson's presence will give him a chance to put some strong plays on the film. For the second straight week, the pass rush will be able to attack a little more than they were able to earlier in the season, when they faced several of the league's most mobile quarterbacks. McCown certainly isn't afraid to take off and try to make a play with his legs, but he's hardly the scrambling threat that Deshaun Watson, Alex Smith or Cam Newton presented. I'd still expect the Pats to remain blitz-averse, but look for them to be aggressive with their stunts up front, as Johnson in particular has struggled with the mental aspects of the center position. Pressure could go a long way towards forcing turnovers from McCown. The veteran quarterback has completed an impressive 71.4% of his passes, but he's also thrown four interceptions. Known for his competitive spirit, McCown's desire to make a play can backfire on him at times, as he'll force the occasional ill-advised pass into tight coverage. If the Pats can get some heat on him with their pass rush, they could create a few chances for the secondary to get their hands on some passes. The Jets defense was long not only a strength of the franchise but a major challenge to face, regardless of the the rest of the team's ability. However, the talent here has eroded to the point of this being a middling unit, albeit one that has performed better on the whole than the offense. They are actually middle-of-the-pack when it comes to scoring (21.2 per game, 15th) and have been alright against the pass, with their six interceptions standing out. However, they've been absolutely gashed on the ground, with four of their five opponents rushing for at least 140 yards on them. It's a far cry from years past, when a defensive line littered with first rounders made running against them a futile cause. Their ineptitude against the run is a bit surprising when looking at the roster, where they still have two former first rounders manning the interior. Muhammad Wilkerson (#96) and Leonard Williams (#92) theoretically represent the strength of this defense, but neither has played up to their potential in 2017 so far. The veteran Wilkerson at least has injuries to blame, as he's slogging through an A/C joint sprain in his shoulder in addition to a toe injury suffered in Week One. Wilkerson has yet to miss a game with his injuries, but he clearly hasn't been the same guy whose play warranted a five year, $86 million deal just one offseason ago. At his best, Wilkerson was an absolute monster, using his strength and fantastic technique to shed blockers and disrupt plays against the run and pass. He's made very few noteworthy plays in 2017 despite playing a full workload. Like Wilkerson, Williams is still seeking his first sack of 2017. The sixth overall pick of the 2015 draft, Williams had played like a future star in his first two seasons, earning an alternate Pro Bowl nod for his play last season. So far in 2017, he's been ok but has failed to be the consistent disruptive presence he was over those first two seasons, both as a pass rusher and against the run. It's hard to pin-point a single reason for his slumping start to 2017, but facing extra blocking attention following the loss of Sheldon Richardson and decline of Wilkerson hasn't helped. It's also possible that a preseason wrist injury has affected his play more than anyone has let on. The rest of the Jets interior rotation consists of run stuffing veterans who bring little to the table as pass rushers. Former Steeler Steve McClendon (#99) is the third man in that rotation, with former Packer Mike Pennel (#98) another depth option. Both McClendon and Pennel have played their role to a "T", offering solid play against the run and little to nothing against the pass. McClendon would likely vault up into a starting role should Wilkerson sit this one out, with Pennel becoming the third man in the rotation. The Jets have gotten a big boost on the edge from Kony Ealy (#94), who has been their top pass rusher since being acquired on waivers after his release from your Patriots. Freed from the mental hurdles that seemed to stunt his development in New England, Ealy has played like the talented pass rusher the Patriots thought they were getting when they traded for him this spring. He doesn't have a sack yet but has consistently generated pressure coming off the edge, while also displaying a knack for batting down passes at the line of scrimmage. Ealy actually leads the team with 5 passes defensed, including an interception. He did sit out last week's game with hamstring and shoulder injuries, but all signs point to Ealy being out there against his former team this week. The Jets will need him, as Ealy has been easily their best edge rusher this year. With projected starter Lorenzo Mauldin shelved on IR with a back injury, it's been 2016 third rounder Jordan Jenkins (#48) starting on the edge opposite Ealy. More of an edge-setting outside linebacker than a true defensive end, Jenkins has been solid enough against the run, but he's done little of note as a pass rusher in his young career. The third man in the rotation (and starter if Ealy can't go) will be journeyman David Bass (#47), who has already eaten up 121 snaps since getting signed off the street in mid September. With Wilkerson and Williams struggling, the Jets are no longer the kind of defense that can get pressure simply by relying on individual talent up front. They've compensating by turning to the blitz in 2017, sending an extra rusher on 40% of their passing plays per PFF. Only the Browns and Texans have blitzed more frequently, with the Jets typically using their second level defenders in those packages. 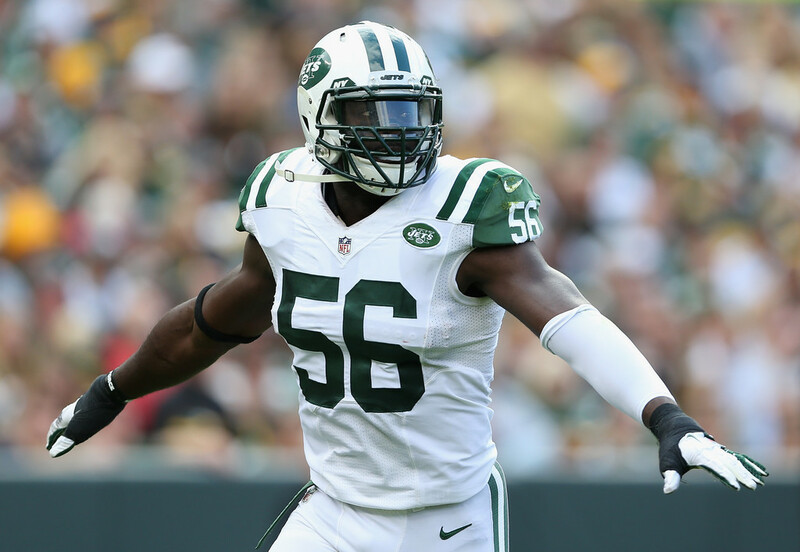 Inside linebackers Demario Davis (#56) and Darron Lee (#58) have been a large part of that. Both linebackers are above average athletes for the position, using their range to chase down ball carrier from sideline to sideline. Davis in particular has been involved heavily in the Jets pass rush, with 44 pass rushing snaps through five games. 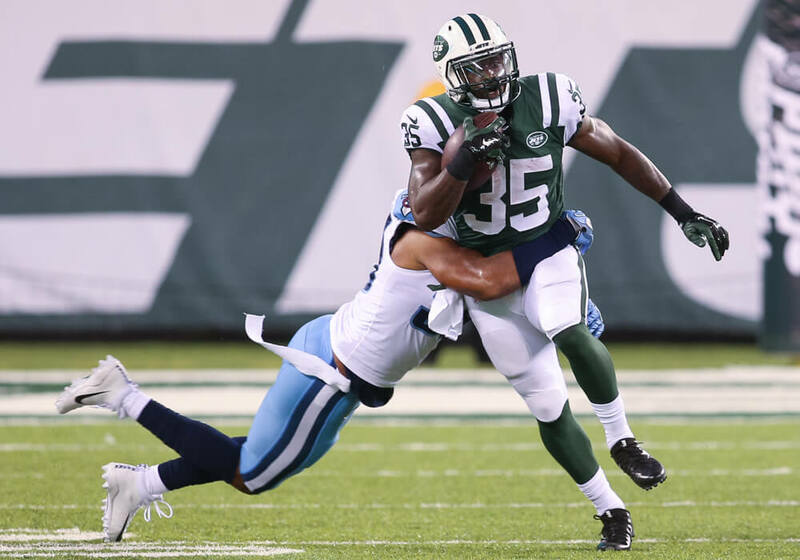 Originally a Jets third rounder in 2012, he's returned to the Jets this year after spending last season with the woeful Browns. Davis was a disappointment earlier in his career, but he's playing some of his best football now, using his athleticism and veteran instincts to be very active on film. So far, he's racked up 1.5 sacks and 33 tackles, with both figures on pace for career highs. He's still a bit on the undersized side and can get overpowered when linemen get their hands on him in the running game, but his range allows him to get around the ball on plenty of snaps. Getting overpowered by larger blockers has especially been a problem for Lee, the Jets first round pick from last year's draft. At 6'1" and just 232 pounds, Lee is extremely undersized for his position. He also brings exceptional athleticism to the second level, athleticism that was supposed to make his lack of size a moot point. Instead, Lee has followed up his poor rookie season with more lackluster play so far in 2017. He's currently tied for 85th amongst 87 qualifying linebackers in PFF grade, as a lack of scheme discipline, poor tackling and an inability to shed blocks have all combined to make his athleticism a moot point on the field. Rookie safety Jamal Adams (#33) has played enough snaps in the box to qualify as an extra linebacker on early downs. The sixth overall pick from this spring's draft, Adams has played well right off the bat, doing a little bit of everything for the Jets. He's a capable coverage player who can play in deeper zones if need be, but Adams' best work has come closer to the line of scrimmage, where he can use his athleticism and instincts to chase down ball carriers. He's been another guy whose been involved in the Jets blitzes, with 27 pass rushing snaps already despite his designation as a safety. When he's not turned loose on the blitz, he could see significant snaps in coverage against Gronk, who is fully expected to play this week after sitting the last one out with a thigh contusion. Adams is athletic enough to run with Gronk, but he'll face a significant size disadvantage in that matchup (Adams is listed at 6'1" and 213 pounds). 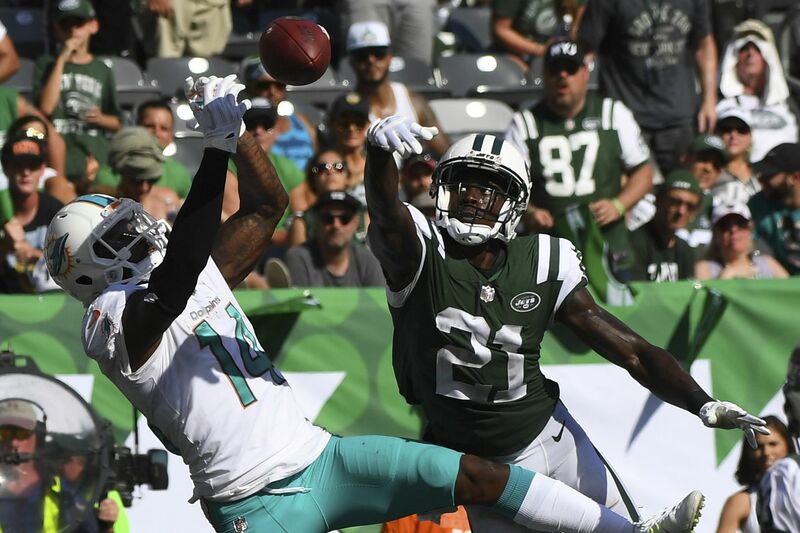 Adams has been part of a revamped Jets secondary that so far has turned things around from a disastrous 2016. Buster Skrine (#41) is the only returning starter from that group, as Adams joins fellow draft pick Marcus Maye (#26) and free agent signing Morris Claiborne (#21) as newcomers who have help transform this group from the defense's weakness to it's strength in just one offseason. He's arguably received the least fanfare of that group, but Claiborne has probably been the best player in the secondary so far. A former top 10 pick of the Cowboys, it was injuries, not talent, that held Claiborne back in Dallas. So far, he's stayed healthy and looked the part of a top corner, using his fantastic reactive athleticism to turn and run with top receivers. As the Jets most physically talented corner, it wouldn't surprise me if the Jets use him quite a bit on Brandin Cooks, who is clearly the Pats most dangerous receiver. Claiborne is bookended by Skrine, the lone surviving reminder of the Jets ill fated 2015 spending spree. Skrine has been an up-and-down player throughout his career, but has given the Jets solid play so far this year. While he's been decent in coverage, Skrine has really shined in run defense, where he owns the highest PFF grade of any corner. In fact, he and Claiborne combine to be the only starting duo to both rank in the top 10 in that department. Skrine bumps inside to slot against three receiver sets, where his lack of size (5'9", 185) is less of an issue. When he's on the outside, the Pats could look to get him stuck in matchups against Chris Hogan, who will have a clear size advantage against him. It's worth noting that the Jets like to blitz Skrine out of the slot, with the corner sprinkling in 10 pass rushing snaps amongst his five games. Third corner duties will likely be held down by former Patriots draft pick Darryl Roberts (#27). Roberts held that role at the start of the season, but has missed the past two games with a hamstring injury. His upgrade from limited to full participation at practice this week is a good sign that he'll be back out there on Sunday. 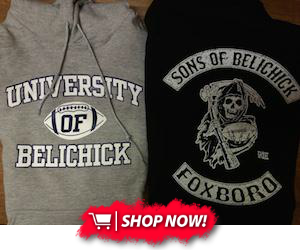 A seventh round pick of the Pats back in 2015, Roberts never played a regular season game for the Pats, losing his rookie year to a preseason injury before being one of the last cuts out of camp last summer. The Jets claimed him off of waivers and he's been with them ever since, showing solid play earlier this year before his injury. A phenomenal athlete, Roberts has the talent to play sticky man coverage down the field. 2016 fourth rounder Juston Burris (#32) rounds out the depth chart and would be the next man up the depth chart should anything happen to one of the top three. The back end of the defense is manned by another rookie, as the Jets used both of their top two picks this spring on safeties. Their second round pick was Florida product Marcus Maye (#26), a rumored target of your Patriots this spring. He's been their starter at free safety from day one and has played well, earning PFF's 10th highest coverage grade amongst safeties. So far it's been an unremarkable season for the Jets special teams. Their strength has come from the punting game, where former Aussie rules football player Lac Edwards (#4) has done a nice job with his many opportunities. The second year man has boomed his punts for a healthy 47.3 yard average, with a long of 70. He has the leg to flip field position, while also having enough touch to land punts consistently inside the 20. The Jets have also been solid returning the opposing teams' punts, with the veteran Kerley averaging a solid 7.7 per return. With opening day return specialist Kalif Raymond now a member of the Giants, kickoff returns are now handled by rookie Ardarius Stewart. With only two return opportunities so far, it's hard to judge Stewart's ability, although his open field running was considered a strength of his as a receiving prospect. Stewart averaged just 20 yards per return last year as a junior at Alabama. Place kicking duties are handled by Chandler Catanzaro (#7), who Patriots fans will remember for missing a would-be game winner against the Jimmy G led Pats during last year's season opener. Catanzaro has been alright so far in his first season with the Jets, making 10 of his 12 field goal attempts and all of his extra points. Catanzaro's two misses have come from the 40-49 yard range, so he certainly hasn't been automatic.